A stunning prequel to the Tales of the Otori series that began with Across the Nightingale Floor, the mystical world of an ancient, feudal Japan, which does for medieval Japan what Game of Thrones does for medieval Europe. 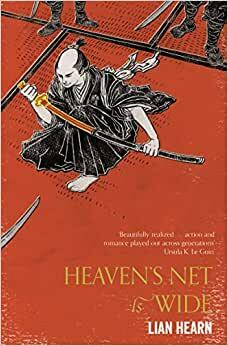 Start reading Heaven’s Net Is Wide (Tales of the Otori Book 5) on your Kindle in under a minute. Lian Hearn studied modern languages at Oxford University and worked as a film critic and arts editor in London before settling in Australia. A lifelong interest in Japan led to the study of the Japanese language, many trips to Japan, and culminated in the writing of the Tales of the Otori series. Hearn is also the author of a two-volume prequel series to the Tales of the Otori, The Tale of Shikanoko, consisting of Emperor of the Eight Islands and Lord of the Darkwood. 5.0 out of 5 starsExcellent love, war story in feudal Japan. This an excellent story full of the history and future of the 3 countries. The writing is fluid and exciting and you can put it down, This is the prologue for the for the Otori series. I didn't read it first but it made me want to read the series again. It is a love story, a war story and a story of the supernatural. It is many things, but what it is, is a great read. 5.0 out of 5 starsVery hard to put down. In my opinion this book should have been first, but with this being said I believe that the author gave you characters whom you felt something for does what they call the "Origin Story" to find out why the father of the main character and his in all ways his wife too. Plus we now know why they turned him into a god after his death and why everyone else felt that it was their duty to place their loyalty to him and his wife. But with everything I could never understand why the main characters became so scared at the very end of the story. Yet I could not put it down, and reading the origin of the characters makes me want to reread the pryor books. Plus it is so well put together. It's very hard to put down. Especially if you enjoy Samurai stories. Yet the words Samurai, Ninjas, Dyamo or Katanas are mentioned in these stories. But you can pretty much determine whose who. 5.0 out of 5 starsAs emotional and wonderful as the 1st 3. I read books 1-3 and found them captivating. I loved the characters and was immersed in their lives. This book 4 is really book 1, a prequel to the other 3. It is bittersweet reading about the beginnings of this man, when you already know how his story ends. It is exciting and wonderful to be back in this tough, pitiless world. I recommend this series to anyone who loves the stories of feudal japan, combined with a bit of fantasy in an alternate verse. I started reading this thinking it was the first in the series, not realizing it was a prequel. Its still good. Like a Japanese tale but its written by a Westerner. Its pretty accurate to true Japanese myth. Jizo really is the guardian god of miscarried and stillborn babies. One thing bugged me. It mentioned the "long nosed goblins that live in the mountains" that were swordmasters. These "goblins" are properly called tengu, not goblins. It had been a number of years since I read the "Tales of the Otori" series and it was just as GREAT as I had remembered it. The writing is tight, the scope is broad, and the characters "realistic" and well developed. Over a few weeks I reread the entire series, all 5 books. I was helped in that I also purchased the Kindle versions, with the Whispersync (Audible), so I could listen to portions on my morning walks, read the hardbacks at home, and take the Kindle version as I was away from home. I enjoyed every minute of it all. Now, having repurchased all the hardbacks, I can pass them on to friends and family (the first time I read library copies). I highly recommend the series!